As fundamental building blocks of matter, protons are a part of all things that surround us. At the Paul Scherrer Institute PSI, however, they step out of their usual role and are deployed to generate other particles, namely neutrons and muons, which are subsequently used to study materials. With this aim, the protons have first to be accelerated. An important role in this is played by a three-stage accelerator facility, in the middle of which stands the accelerator known as Injector 2. Three accelerators arranged in series make up the facility for proton acceleration at PSI: It starts with the mushroom-shaped, roughly 10-metre tall Cockcroft-Walton accelerator, in which the protons are generated and pre-accelerated. It ends with the large proton accelerator, a ring accelerator, which in technical jargon is called a cyclotron. Here the protons are accelerated to 80 percent of the speed of light. 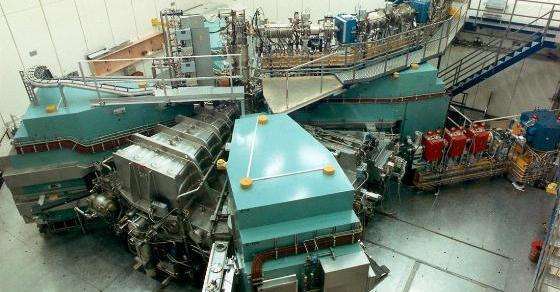 In between stands Injector 2, a smaller ring accelerator, likewise classified as a cyclotron. Its job as a pre-accelerator is to deliver protons to the large cyclotron with 38 percent of the speed of light. Like the gears in an automobile, the accelerators build on each other consecutively. Think of Cockcroft-Walton as first gear: The protons get an initial acceleration along a straight stretch. Injector 2, second gear: The speed of the protons is increased as they circulate around the ring. The large accelerator, third gear: Again going around in circles, the protons are brought up to the desired end speed. As in driving a car, you just can't do without first and second gear. After the protons are generated, they are guided through a vacuum inside the Cockcroft-Walton so that they will not bump into air molecules. Here vacuum does not mean simply an evacuated chamber, since a little bit of air always remains. A vacuum can have varying quality – the better the vacuum, the less gas it contains. The vacuum surrounding the protons is not exactly of the same quality everywhere as they make their way through the three facilities. The vacuum maintained in Injector 2, for example, corresponds to one-billionth of atmospheric pressure; in other words, only extremely small traces of gas are present. Each of the three accelerators is housed in its own hall. On first sight, Injector 2 appears in its 12-metre high, almost nearly square-shaped room, in the form of alternating turquoise-coloured magnets, four in all, and four silver-coloured resonators – all roughly as tall as a man – which are radially aligned. From above, this arrangement of magnets and resonators looks like a cake already cut in portions, with the tips of the slices trimmed off. The resonators produce an alternating electric field by which the protons are increasingly accelerated. And the magnets ensure that the protons circulate around the center of the injector 80 times. The magnetic field varies from the middle toward the outside in such a way that the protons, which start their circulation on the inside, always need the same amount of time to complete one lap, even though the path they take is always getting longer. Protons are not loners in the accelerator. They travel in small groups or bundles. Since protons carry a positive electric charge, they repel each other and, along their trajectory, move away from each other within this grouping until an important effect sets in: With time, according to Joachim Grillenberger, responsible for the operation of the proton facility, the beam focuses itself. What that means is that after ten or twenty laps around the ring, the proton groups bundle themselves together and assume a ball-like shape, which they then retain. To adjust the beam of protons in Injector 2, collimators are used. These components are made mostly of copper, have an aperture, and are positioned at suitable places along the protons' spiral path. Only protons that are moving on the ideal trajectory pass through the aperture of the collimators, and all other protons are absorbed by the copper. After being accelerated in Injector 2, three paths are open to the proton beam. The biggest portion of the proton beam is guided onward to further acceleration in the large cyclotron. The accelerated protons first hit a target device consisting of rotating carbon discs, generating pions and muons in the process. Then they continue on their way, finally colliding with a metal block to produce neutrons. While pions, muons, and neutrons are themselves central to research, they also, on the other hand, help researchers gain insights into the composition of materials. A very small part of the beam current, around two percent, can be sent down a second path immediately after Injector 2. These protons then produce radionuclides that are applied in the development of pharmaceuticals. Such medicines are used in cancer diagnostics. The third path leads to a dead end where the protons simply get absorbed. Protons are always channeled this way if they lack the appropriate properties for the two other paths: The protons are, in such a case, either too slow or too fast. When the proton facility commenced operation in 1974, the main aim was to use the protons to generate pions. It was thought that pions would help to address the then-current questions in particle physics. Since that time, the facility has been adapted again and again to meet the needs of science. In the beginning, the facility produced a beam current of 100 microamperes, extraordinarily high for conditions at the time. Joachim Grillenberger: Today, around 40 years later, a beam current 24 times higher can be generated. Naturally, this is only possible because the facility was always being improved and further developed. The constant improvement yielded a world record for the proton facility that it has held since 1994: It delivers the strongest proton beam worldwide. To stay at the forefront of accelerator technology, you can't rest on your laurels. Injector 2 is one link in the chain of the three-stage proton accelerator facility. It too must always be kept technologically up-to-date to continue to meet the high demands for performance and operational reliability, says Joachim Grillenberger. At present, together with colleagues, he is leading a project that will make Injector 2 even more capable: In 2018 and 2019, new resonators will be installed, and the entire amplification chain will be modernised. As a result, the particles will be accelerated in an even shorter time span and fewer protons will be lost in the acceleration process – boosting the performance of the whole facility. Thus the accelerator experts are contributing as well to modernisation of the spallation neutron source SINQ, which relies on protons from the accelerator facility to generate its neutrons.